Lincoln Walmart parking lot and main entry. All the words, feelings, and media storming around the proposed Walmart Neighborhood Store at the southeast corner of Lincoln Avenue and Figueroa made it hard to separate signal from noise the past several weeks. Dialing up the volume, Walmart confirmed last Friday, July 6, (one day after AH board members met with Walmart reps) that a second Walmart site is being discussed at Lake Avenue and Calaveras — owned by the same landlord, Mr. Arman Gabay, whose agent, the day before, denied knowing anything about it. For a straight-forward informational report on board members site visit and impressions of the in-the-works Lincoln outlet, please click on WalMart Lincoln Site Report. For a rambling/historical take on the larger issues and questions raised by the possible catapulting from zero to two Walmarts in Altadena by board member Michele Zack, continue reading below. Altadena Heritage board members are observing closely and wondering where, as Altadena’s oldest cultural and architectural preservation organization, we should stand in the Walmart controversy? If our board and the general membership decide action is required, what would it be and how could we be effective? We seek member participation in sorting through the issues, and invite comments, especially from those interested in working on this, to email Altadena Heritage. What do you think? With this post and our site report, we are launching an informal survey as we don’t know if the overwhelming antipathy to Walmart found in the Altadena Patch survey reflects our members views. Non-members feel free to weigh in, but please identify yourselves as such. Let’s have a civilized conversation, without repeating everything already said! Four years ago a prospective investor, (a former manager of Hortus Nursery in Pasadena) contacted Altadena Heritage to ask for support to put a full-scale nursery/patio/design shop at the new Walmart site. We thought this would be a great use and encouraged him, but for reasons we were not privy to, this dream was not realized. Years passed and our local Redevelopment District, like all others in California, was disbanded because of state budget crisis. It should be noted that the Lincoln Corridor, while still blighted in some areas along its long north-south path, has been the single greatest recipient of private and public investment in Altadena over the past 20 years. It shows; pockets of new growth are noticeable although they were not realized without a lot of conflict. Beginning with LaVina at its northernmost end in the mid-1990s and improvements at Loma Alta Park including an equestrian center and new gym, through the Lincoln Crossing Project (grocery store, sport club, bank, retail) of the early 2000s, one could argue that investment has flowed where needed in Altadena — even if results were far from perfect in the eyes of many. In balance, these nodes of development may be considered successful, and have boosted cultural activities such as the ever-improving Community Garden and the new Altadena Farmers Market (sponsored by Altadena Heritage). Even the recent failures of a couple of private schools wanting to occupy an existing site on West Palm signals that “value” investors are awakening to obvious potential in areas of Altadena west of Fair Oaks formerly considered too risky. When it was suggested by a County official that Altadena Heritage should respond to Walmart’s “outreach” efforts to talk to various groups and stakeholders, we made an appointment for a site visit to hear from Walmart and its developer, to ask questions, and to see for ourselves its context within the neighborhood. By the time of our meeting, rumors had turned into cold solid fact that Walmart intends to come to town, leasing a “by right” site already zoned for the use, a grocery store, that it says will open in early 2013. “By right” means no conditional use permit is required to open the store, and thus no public hearing about any objections will be heard until Walmart applies for a liquor license. The “Neighborhood Store” that will open in January or February 2013 will not sell alcohol — but that it will open appears to be a done deal. Board members at the July 6 meeting were Mark Goldschmidt, France Meindl, David Mosher, Vivien Fortunaso, and Michele Zack. Representing Walmart were Randy Terrell and Javier Angulo, and for landlord Arman Gabay, Gene Detchemendy. Mr. Gabay is responsible for doing actual rehabbing/construction of the facility that Walmart will lease. In addition, Mr. Terrell invited two Altadena Councilmen, Tecumseh Shackelford and Brent Musson, representatives of the census tract in which the Walmart is located. Their presence came as a surprise, but we proceeded to hear from Walmart reps and to ask our questions. We would like to ask for member volunteers to check out surrounding business areas around Walmarts in Monrovia and other Southern California sites, and report on your findings. Email them to altadenaheritage@earthlink.net to help us gather local, up-to-date information about the giant retailer. Relying solely on information gleaned about “Walmart Super Stores” in other parts of the country with different economic conditions doesn’t seem wise. If anyone can conduct online research of “Neighborhood” Walmarts in different places, or if you have actually been in one, we’d also be very happy to hear from you. Yes, we’ve seen the movie and read tons of online information about the evils of Walmart. Most of us don’t shop there. Still, we prefer to do some snooping of our own and not rely on internet and other media sources for all our information. Example: I have asked several checkers at Super King if they get any health insurance and have been told “no” by at least 3. That’s the sort of relevant, local information we feel should inform the discussion. The fact that low-level service jobs don’t pay very well or come with great benefits is not news — or that wages in the lower and middle rungs of society have been flat or declining for a generation. We live in a capitalistic democracy and all share some responsibility for the decline of union jobs and outsourcing of labor allowing cheap prices on goods and services that most Americans happily consume. 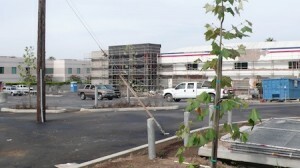 Parking lot landscaping is nice, sycamore or plane trees, with native grasses and succulents. New stucco and paint will go on in next weeks, followed by interior improvements. Currently there is a dirt floor in the building, which has been gutted to the walls. We are disappointed there is no front or side door in the current plan, all entry/egress is at the back. This makes the store automobile-oriented and fortress-like, does little to increase Lincoln’s pedestrian interest/walkability — but is accessible to residential area behind it and across the street on Figueroa. Although the Project Area has been disbanded, we mentioned that Walmart and its landlord could still choose to follow design guidelines coming out of the community visioning process sponsored by LA County for the West Altadena Redevelopment Project around 2000. These are still relevant, and encourage front windows and doors on businesses facing Lincoln, as well as planting of street trees. Such amenities create interest and a commercial “down town” feel that inspire community interactions and attract pedestrians. We expressed hope that Walmart has time to make a few changes showing good will and putting the store in compliance with community vision. We have since followed up on our promise to help get street trees in front of the store along Lincoln, which Walmart rep offered to pay for if the County will supply permits. We’ll report on progress. We are concerned that the “Site-to-store” service (whereby many products sold through Walmart’s catalogue may be ordered online and delivered to the Altadena site), could negatively impact existing, and discourage prospective, small businesses. Toward end of meeting we asked everyone present if they could tell us anything about discussions underway for a second Walmart at Calaveras and Lake Avenue. Walmart reps, Mr. Gabay’s rep, and Town Council reps all denied knowledge of any such development. The next day, after news of it broke, Mr. Terrell did call to say he had just heard about it, and did not want us to think he had been withholding information. Several times in our hour or so site visit, the landlord’s rep Mr. Detchemendy mentioned that Altadena’s CSD (Community Standards District), particularly the special North Lake Section, was “holding the community back” and should be repealed. He thought the ban on drive-through businesses was particularly bad, since people driving south on Lake on their way to work would like a Starbucks, and that company likes to have the “drive through” option when siting new outlets. “Outreach” is not the same as a public hearing, and many in Altadena who were unhappy about one Walmart, are apoplectic at the prospect of two. Opposition that reflects what a lot of people in Altadena feel is fast organizing. This is as it should be and we applaud such activism. We at Altadena Heritage want to be careful not to jump on board the “angry train” not knowing how effective it might be, or if there is any room for compromise or differing views on this fast-moving engine. Being the most ardent protester/supporter isn’t always the best way to prevent or create something, nor is it particularly helpful in establishing a positive alternative. We saw this during the fight over LaVina, where the community was effectively divided and ultimately conquered by developers. Altadena has always lacked control over planning. This is especially true in commercial districts. County parking requirements for new business, for instance, are so onerous that most small businesses cannot afford to even try locating in Altadena — they are discouraged by a regulatory thicket, even though small businesses are what Altadenans say they want. To ask the questions of the County: May I get a liquor license and a parking variance costs about $30,000, and there is no guarantee the answer will be yes to either question. The Town Council and Land Use Committee have been more effective in overseeing modifications to residential properties, but because many of our lots are of non-uniform sizes, some requirements are impossible to meet and require going through a CUP process that costs from $5,000 to $10,000 and takes about two years. Incorporation, which would give us more power, seems not to be an option. Many well- funded and thoughtful campaigns with this objective have failed over the past 100 years, and the current financial situation makes it even more improbable. We have just begun a visioning process about what Altadenans want to see added to, eliminated from, or changed in our CSD; the timeline mentioned by the county for this process is about two years. Walmart is the first major retailer to have awakened to Altadena’s value recently — and to have done the math on 43,000 consumers here with average household incomes higher than Pasadena’s. Can others be far behind? It seems possible to incorporate some of the planning tools every city has into our revised CSD. One would be to require a public hearing on any building over a certain size, particularly on Lake Avenue, but perhaps in other commercial zones as well. With that and other oversight in place (such as real fines for leaving commercial parcels vacant and derelict, such as the newest proposed Walmart site at Calaveras and Lake) Altadena could articulate a vision for the future instead of fighting each battle, one building at a time, one developer at a time, every time a controversial development like Walmart comes to town. More will be more coming. Can we be better prepared? We must ensure the visioning process continues, perhaps accelerating it to ward off the kind of development that most people probably do not want. At Altadena Heritage, we have not taken a position and at this point feel we can best serve the community by bringing more relevant information to light and advocating for high quality development. The two Walmart sites are very different: one is a blighted corner of a former redevelopment district, and the other, while an eyesore, is at the heart of historic Altadena across from the iconic Marston and Mayberry Eliot Middle School and the beautiful brick Mount Lowe Generating plant. Altadena Junction, at Calaveras and Lake, was where it all began here and has strong potential to be developed into something all Altadena can embrace. Maybe now that the big money boys are finally awakening to our charms, we can pull together and decide as a community what we want and find ways we might realistically be able to get it.Please write in any comments on this or our Lincoln Store site visit report. We will read everything and report back!